Can I feed my 8 month old citrus? Yes you can. Oranges, grapefruit, limes and lemons are a great source of vitamin C and should be encouraged. While most tolerate citrus well, it can cause some children to get diaper rashes. 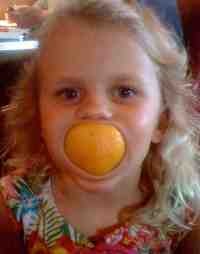 One of my daughters loved orange juice. If she drank too much she would get a diaper rash the same day. These rashes are easily treated with local care and avoiding citrus for a couple days.